Digital UltraViolet and Digital Copy will makes it possible for you to stream the movie Superfly HD UV or iTunes Code instantly to your computer and compatible Smartphones, Andriod, iphone, iPod Touch, iPad and tablets devices anytime, anywhere. 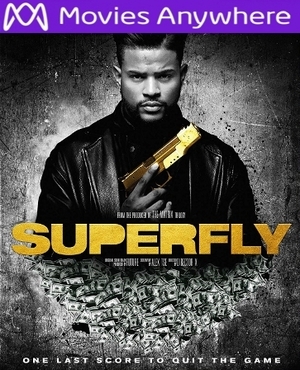 You can also download a Digital UltraViolet Copy or a Digital Copy of the movie Superfly HD UV or iTunes Code to your computer and compatible devices. SUPERFLY is a remix of the iconic film that defined a genre through its characters, look, sound and feel. Told through the artistic lens of visionary, Director X, this newest take is set to a soundtrack curated by Future and modernized in the city of Atlanta. An action-packed film that follows Youngblood Priest [Trevor Jackson] as he attempts to achieve his �American Dream� all while redefining The Hustle.